A Day In The Boat Life On The Amazon River People networking, just hanging out, praying, escaping city bustle, commuting to work — just another day on the White Swan riverboat. 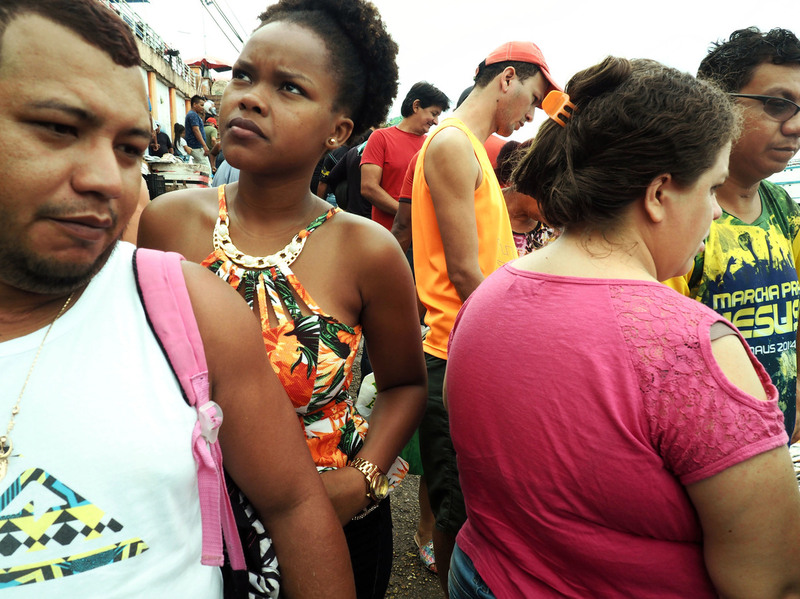 A couple watches boats pass the docks in Manaus, a city on the Amazon River. Pop-up restaurants like this line the docks to dish homemade Brazilian fare to ship travelers and crews. 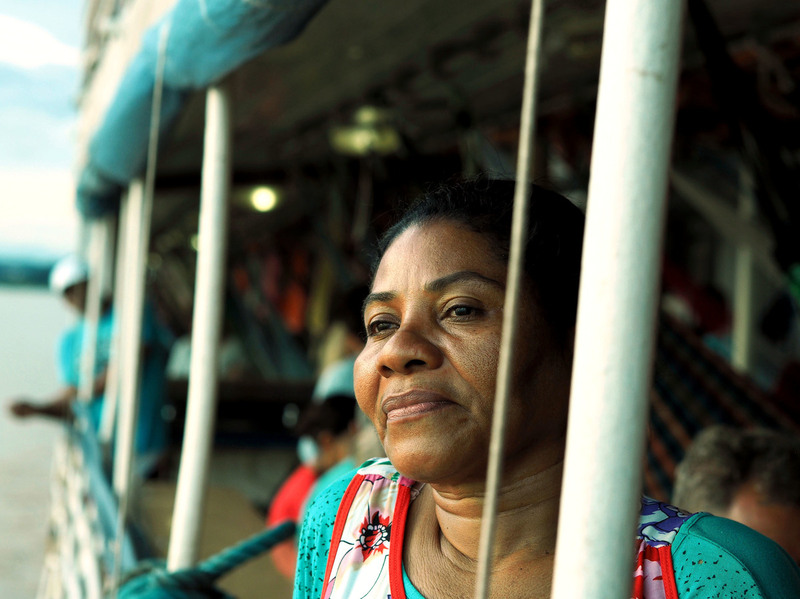 Thousands of working Brazilians sail on Amazon riverboats each day to carry out their business and personal lives, in a region where the main superhighway is one of water. Many sleep in hammocks instead of bunks, where they peacefully hang like bats at night and naptime. These hammocks fill the middle and lower decks of the White Swan, a rusty, 67-year-old ironclad ship piloted by a man known to all as "Mustache." NPR boarded for a journey with about 100 passengers, along with cars, machine parts and merchandise from gourds to makeup to musical instruments. 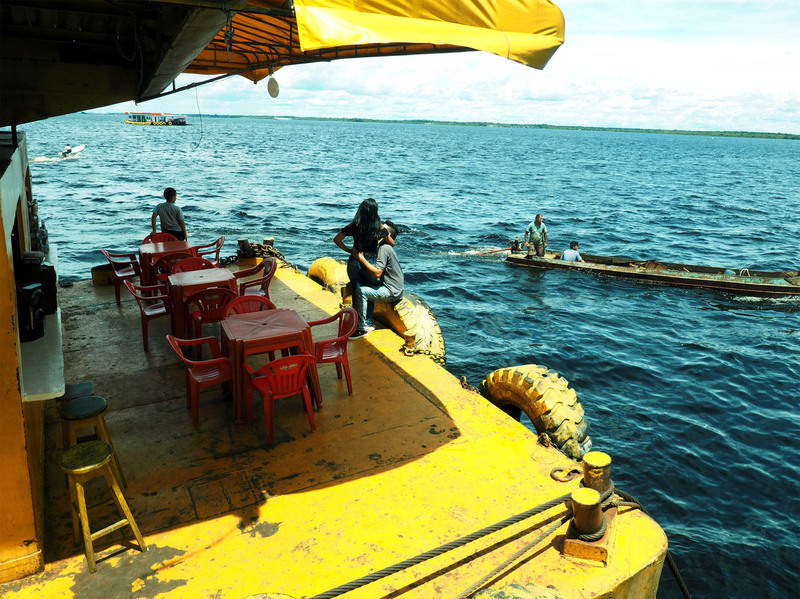 The ship sails between the cities of Manaus and Belém, where the river pours into the Atlantic. Travelers and shoppers weave through the Manaus docks. Many come for the small fishing boats that sell fresh catch before it goes to the city market. 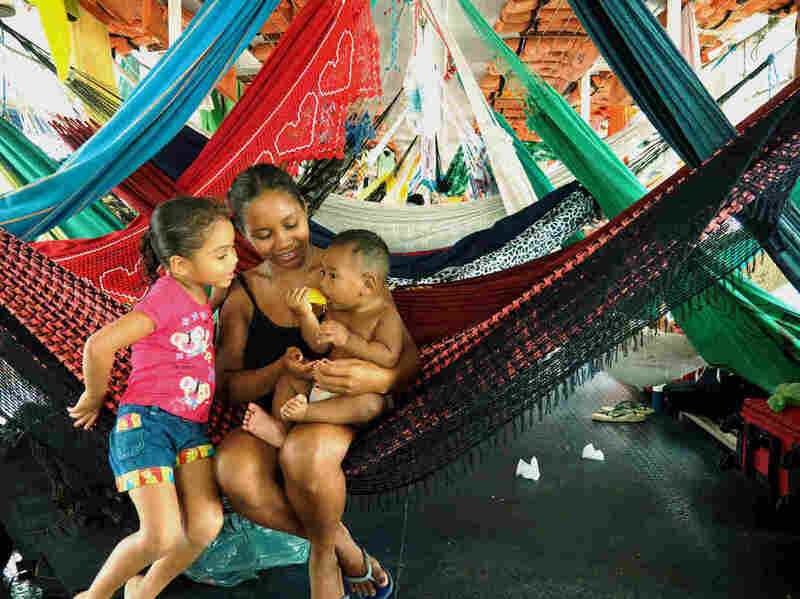 The community that forms onboard during the four-day trip shows how Brazilians in the country's north lean on each other — and remain connected to nature — as the country struggles to recover from a deep economic recession. Ship bartender Conceição Souza likes to call the river where she's worked for 28 years the "world of water." She says passengers frequently swap contact information with each other and with the crew in order to stay in touch. 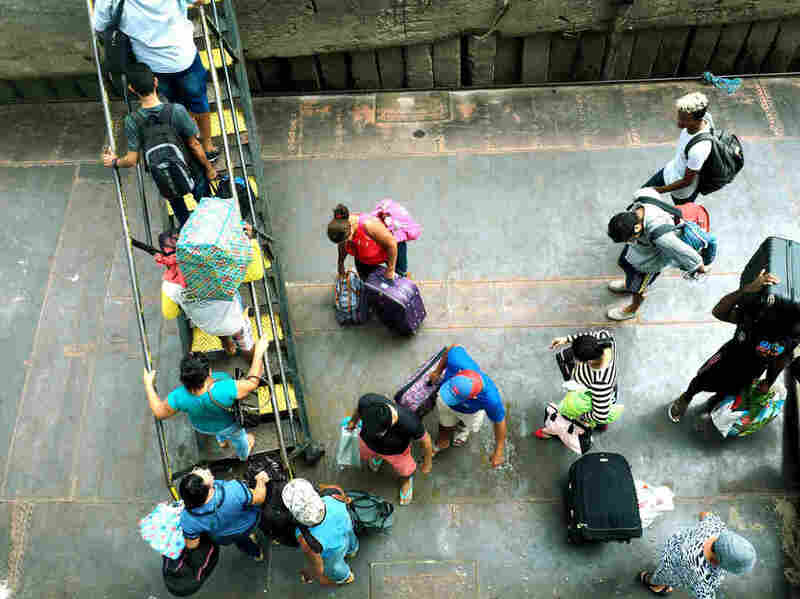 Most passengers aboard Amazonian riverboats pack only as much luggage as can be stored beneath their closely hanging hammocks. For trips that can be up to a week or more, they bring food and items that are unavailable or highly expensive at their destinations. Christian missionary Mari Dalva, 50, travels the Amazon several times per year in search of people who need help along the shore and on board. Aboard the White Swan, she organizes nightly prayer circles with other evangelicals she meets. Over the years, the ship's travelers have observed hundreds of tiny riverside communities slowly growing less poor, with some families adding small engines to their paddleboats and expanding their wooden stilt houses. But the region has also seen rising violence related to the war on drugs. 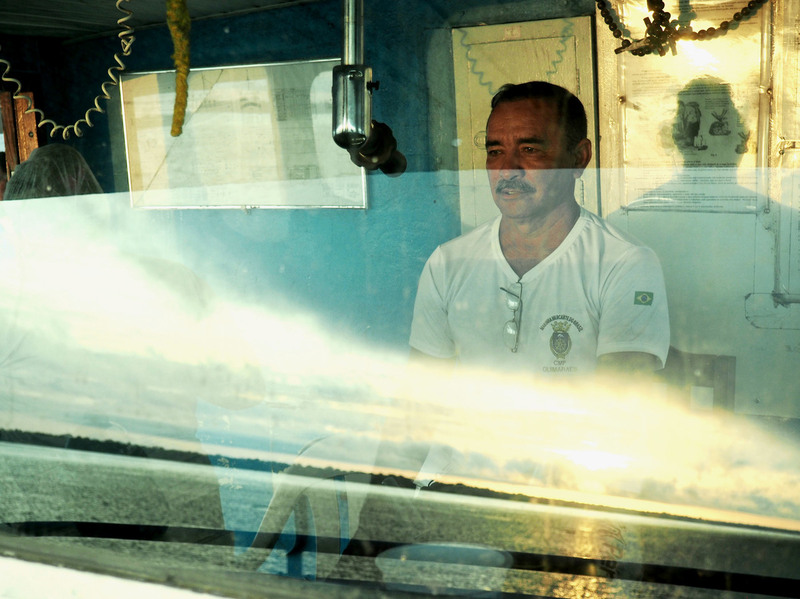 Some of the few in-demand jobs in this tough economy are security guard positions, like the one drawing White Swan passenger Dione Negreiro, 34, to Belém. Brazil's federal police inspections of Amazonian ships for illegal drugs and weapons have become routine. As the Amazon narrows in an area called the Breves Strait, residents of small riverside communities come out to watch the passing ships. Longtime sailors have watched these communities grow slowly less poor over the years, acquiring satellite dishes and small engines for their boats. To protect their passage, evangelicals on the boat organize worship. It's a sign of Brazilian evangelical Christianity's ubiquity and power that an hourlong service of hymns and prayers — punctuated by tears, yelling and shouts of "Hallelujah!" — yields no complaints from dozens of nearby people on hammocks. Passengers donate used clothes to small riverside communities by tying them in plastic bags and pitching them overboard when canoes approach. Some families ride up in small motorboats, lash them to the White Swan and clamber aboard to sell salted shrimp and giant green beans. The Amazon River churns powerfully through one of the world's most biodiverse habitats, which in this part of Brazil includes rubber, palm and açaí trees knit together like giant lace. Pink dolphins share the vast mud-colored waterways with piranhas and the occasional alligator. For many travelers, simply spending time in nature helps ease life's difficulties. Giovanna Machado enjoys a mango snack with her son, Pedro, and daughter, Jennifer. They are staying in the White Swan's middle deck, where travelers snooze in hammocks during nights and daytime naps. Diulcinei Guimarães, who has been sailing up and down this river for a quarter century, surveys the sunrise. Crew members and passengers universally know him as "Mustache." Thirty-two-year-old carnival artist David Penha takes in views from the top deck, blissfully separated from his cellphone. The river is so wide that it makes the Amazon jungle on each side look short. Old ships half-sunk in sand, yellow-painted school boats, and floating fuel stations hint when villages are near. Venezuelan sisters Gikleidys Rojas and Metchells Rodríguez enjoy the Amazon's blooming sunrises and sunsets as a rare pensive leg of their journey fleeing Caracas. 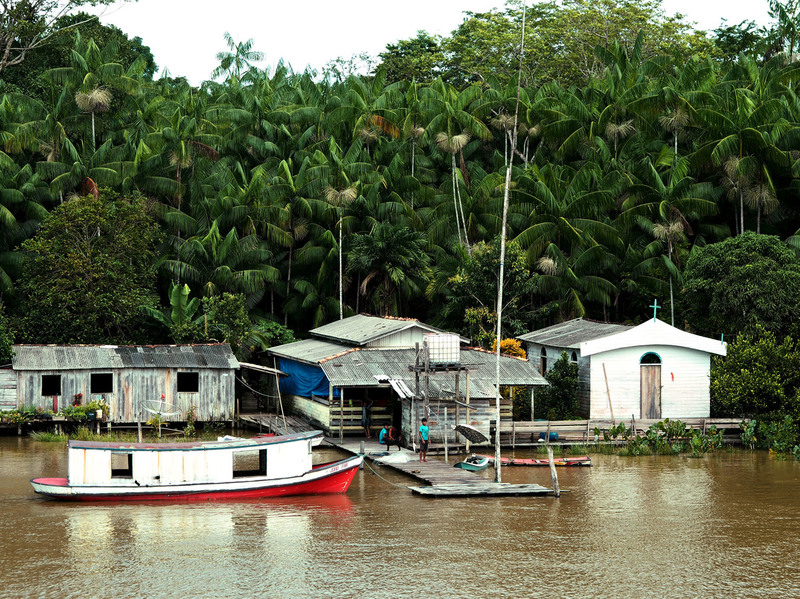 The White Swan docks for an overnight stop in the industrial city of Santarém in the northern Brazilian state of Pará. Heat lightning flashes through the night as passengers sleep in hammocks and crew fetch new cargo for the next leg of the journey. They echo a comment from Souza, whose bartending paychecks helped take care of her siblings after their mother died: When it looks like options are slim, she says, the river offers a chance to move. 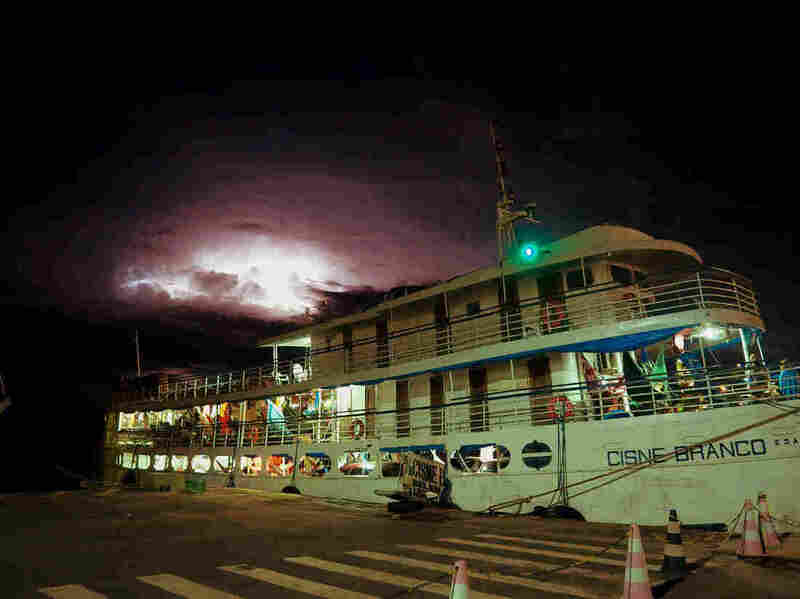 NPR correspondent Phil Reeves and reporter Catherine Osborn recently reported along the Amazon River on a journey across Brazil.